When you need to spend a penny, prepare to pay a lot more. Above: Public toilets in San Polo. INSET BELOW: In bars, you'll occasionally find Turkish-style toilets. 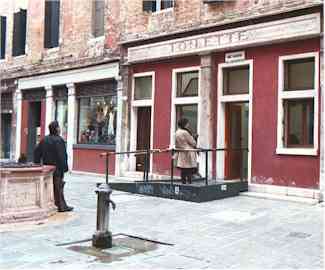 Venice is often criticized for its shortage of toilet facilities. To some extent, the criticism is justified--after all, the city welcomes an estimated 12,000,000 tourists a year, yet it has only a handful of public WCs scattered around the half-dozen sestieri, or districts, that make up the historic center. It doesn't take a plumber to realize that the existing facilities are going to be overwhelmed when 100,000 tourists show up with their water bottles on a typical summer day. One could argue that building enough toilets for the masses would require destroying many of the buildings and monuments that tourists come to see. Large-scale deployment of lavatories would also displace even more Venetians than the 1,200 who already flee to the cheaper, less crowded mainland in a typical year (maybe in search of a place to pee). If it's any consolation, the city has promised to build more public restrooms as part of a major effort to improve tourist facilities. The city recently doubled the prices of using public WCs in what critics have called a "toilet tax" on visitors and residents. Know where to go. See the list below. Go when you have the opportunity. Use your hotel bathroom before you start the day's sightseeing. During a museum visit, look for the restroom. At better restaurants and cafés, use the loo before you leave. Carry change for toilets, which often have turnstiles at the entrances. Public WCs of AMAV, the Venice sanitation authority, charge a mind-boggling €1,50 unless you have the Venice Connected pass. Larger museums (such as the Doge's Palace) have attended restrooms with posted fees. In other museums and galleries, toilets are often free. Pay attention to spelling. "Signori" means "men," and "Signore" means "women." Fortunately, many restroom signs use icons instead of text. Don't be fazed by unisex facilities. Some museums don't have separate restrooms for men and women. Instead, an attendant directs you to the next vacant toilet stall, or--in some cases--banks of men's and women's toilets face a common row of washbasins. This isn't as alarming as it may sound; unisex restrooms normally don't have urinals, and toilet stalls are enclosed from floor to ceiling, with solid walls and doors. 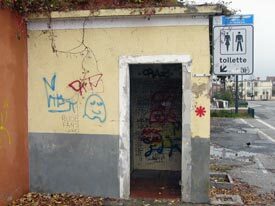 ABOVE: Fortunately, the official public toilets are nothing like this lavatory near the Port of Venice's San Basilio cruise pier. Giardini ex reali San Marco. 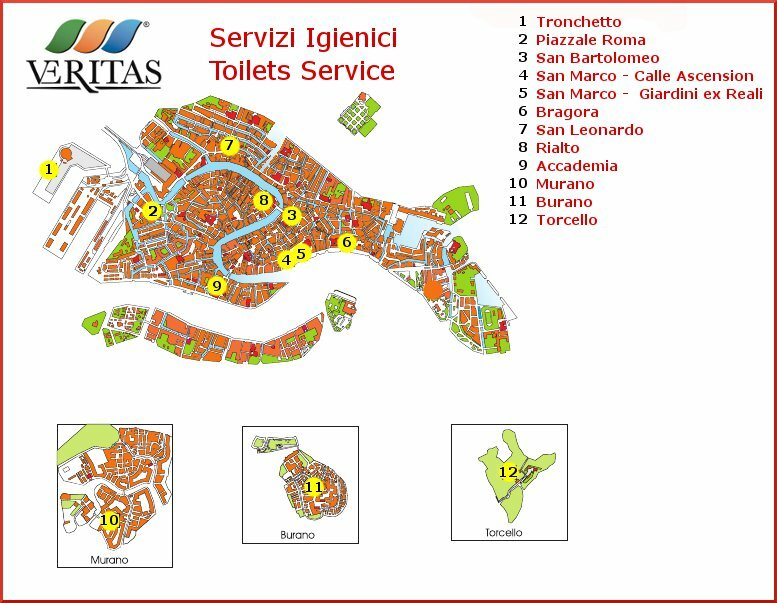 This lavatory is on the waterfront, next to the tourist office by the small park just to the west of the Doge's Palace and the Piazzetta. Accademia, at the foot of the Accademia Bridge on the Dorsuduro side of the Grand Canal (near the Accademia vaporetto stop). Piazzale Roma, where airport buses and municipal buses arrive in Venice. The Tronchetto parking island, if you're arriving or departing by car or tour bus.